Each week I try to make at least two desserts for my family. If it was left up to me every sweet would involve chocolate, but my husband and two boys prefer a larger variety of tastes. Given that I make cookies and cakes as often as I do, we can get tired of recipes pretty quickly, so I'm always on the lookout for interesting or unusual combinations. A recent issue of Bon Appetit magazine had a recipe for Lemon-Lime Basil Shortbread Cookies, which looked different than the usual cookie recipes I make. With seven ingredients, this recipe goes together very quickly. Most of the prep work is done in the food processor, making for a very quick dessert. The total time including cooling, is approzimately an hour and 15 minutes, with 20 minutes of active time. I followed the recipe as stated, with no modifications. I was suprised that my two boys liked these cookies as much as they did. The use of the basil left me unsure if my kids would endorse these cookies or not, but my five year old loved them! My husband liked the burst of lemon flavor that came through with every bite. I liked how easy these cookies were to make and that they used fresh herbs, something that few dessert recipes utilize. These cookies are a perfect combination of sweet and tart and would make a great addition to any cookie plate. 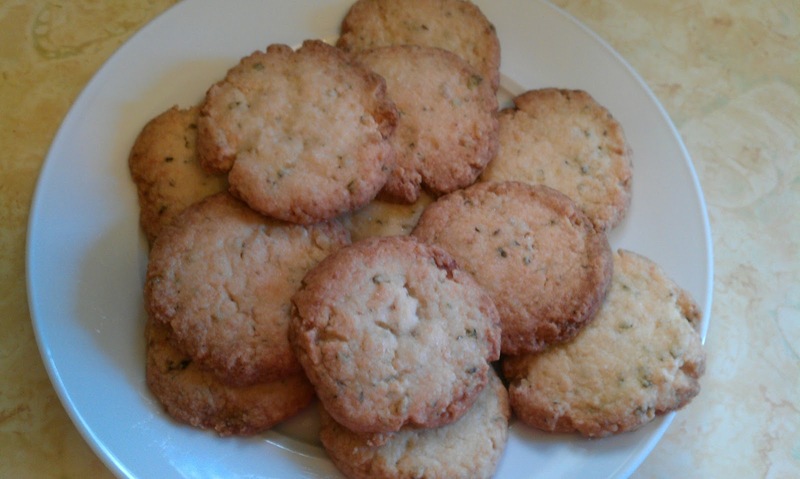 For the recipe go to Bon Appetit Lemon-Lime Basil Shortbread Cookies. Those sound yummy! We aren't big dessert eaters at my house, but I might try these for a party! Nice flavor combination, can't wait to try. Thanks. Hi Frugal! Laura from MBC. Thank you for following my blog; I just started following yours. I'm glad to see I'm not the only one - well, other than Giada, of course - using basil in sweets! Great flavor combination! Mmm, this looks wonderful! My sister requested a recipe series on recipes that includes approximately 5 ingredients, I just may feature this one! Thanks for following my blog! I love the sound of this biscuit. I don't have any basil at the moment but will definitely buy some this weekend! Thanks so much for stopping by my blog and following me. It's lovely to meet you! Following you now too! Thanks for visiting my blog and following! I am now following you back on GFC, Networked Blogs, and I liked you on Facebook! Following you back from the Find New Friends bloghop! These look delicious! @Laura I love using basil in sweets, the flavor combination is delicious! @newbiemama These are very simple and easy to make! @ALeighEdwards I hope your cookies turned out well! @Natashainoz I had to buy basil also, I wish that we had more room for a garden :) If you try the recipe I hope your enjoy it! Great flavor combination in a cookie. Sounds delicious.